Access unlimited travels on local, limited express, and express trains including the iconic Shinkansen! 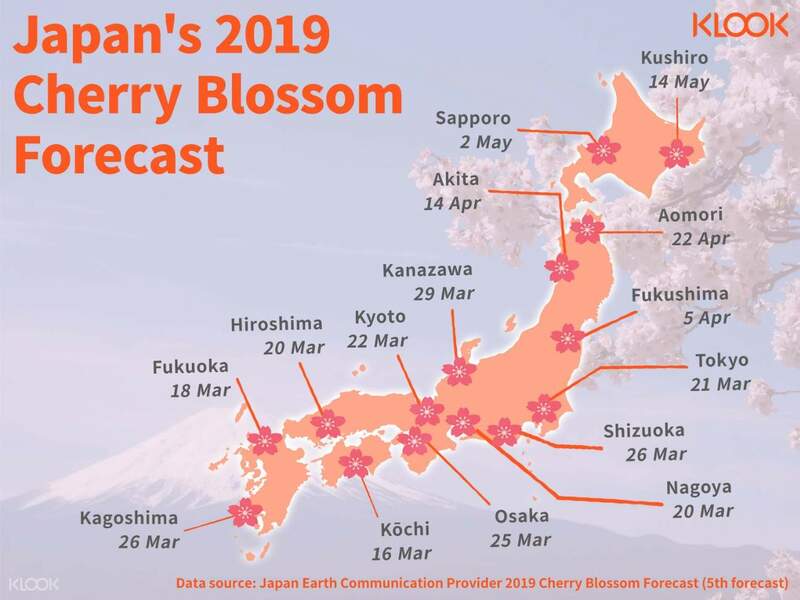 Also valid for the Shinkansen, Narita Express and Tokyo Monorail! Start with a trip from Narita Airport or Haneda Airport where you can redeem your printed voucher for your JR East Nagano Niigata Area Pass! Travel to Tokyo, hop aboard the Shinkansen (Japan's high speed bullet train), or a limited express to discover the picturesque wonders of Nagano or Niigata. In addition to the JR East lines, your pass allows you to take advantage of some non-JR trains in Izu and Nikko areas. 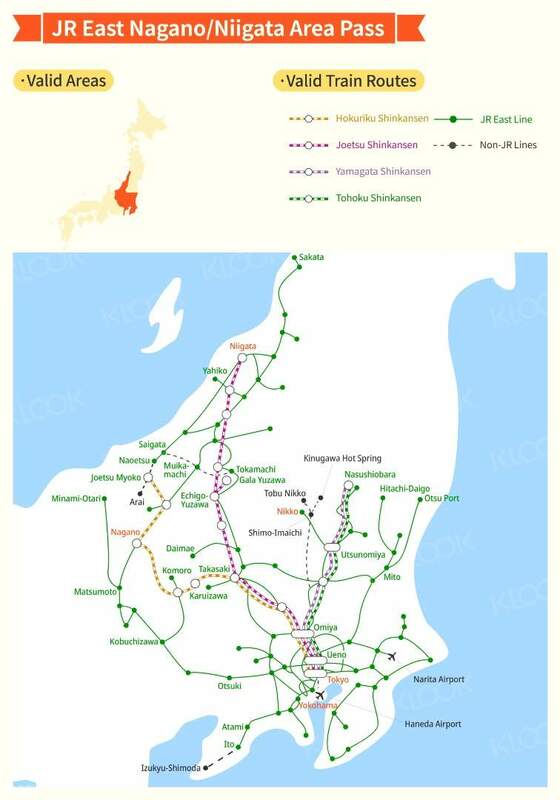 There is simply no better or more economic way to cover Japan than by riding on the country's incredibly modern and expansive rail network. 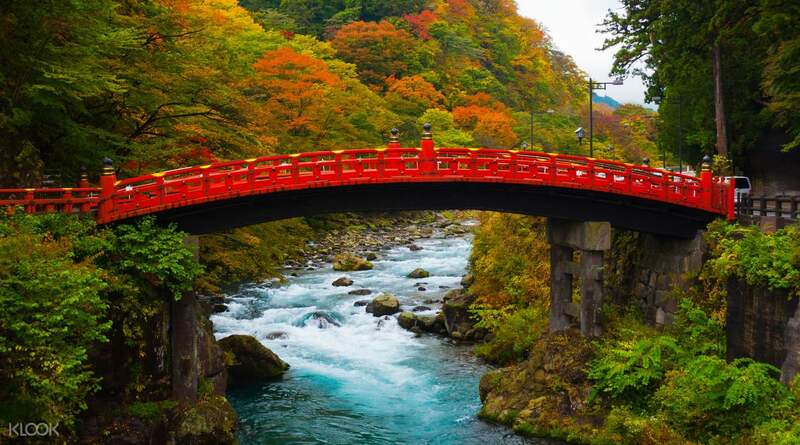 Book your JR East Nagano Niigata Pass now, and see what Japan has to offer! Enjoy unlimited train travels for 5 flexible days and explore the cities of Nagano and Niigata in no time! 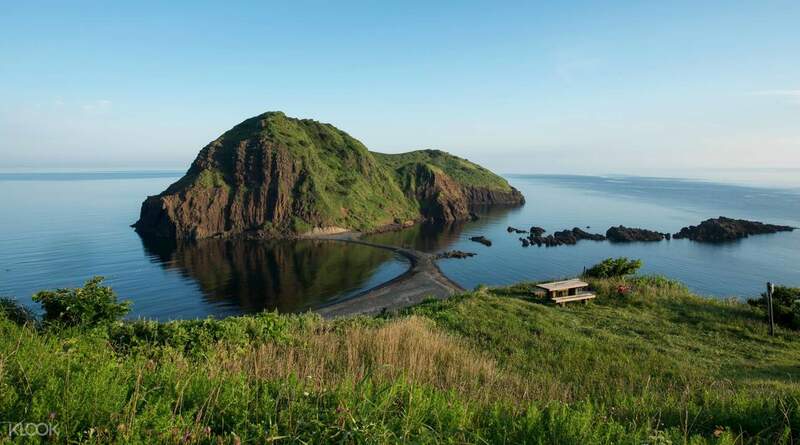 Visit the city of Niigata with the JR East Nagano Niigata Pass, the gateway to Sado Island! (2) When an infant or baby occupies his or her own reserved seat, Green Car seat or berth, etc. We weren't able to pick up the JR passes at the JR East Office in Narita Terminal 2 as it closes at 8 p.m. But we were able to pick up our passes the day after in Shinjuku office without having any hassle. We have chosen this type of pass as we deemed it is cost-efficient for our travel to Nagano Prefecture, and Nikko in Tochigi Prefecture. It is best to book a reserved seat when riding the Shinkansen for a hassle-free travel. We weren't able to pick up the JR passes at the JR East Office in Narita Terminal 2 as it closes at 8 p.m. But we were able to pick up our passes the day after in Shinjuku office without having any hassle. We have chosen this type of pass as we deemed it is cost-efficient for our travel to Nagano Prefecture, and Nikko in Tochigi Prefecture. It is best to book a reserved seat when riding the Shinkansen for a hassle-free travel. Jr pass is the best option to travel around tokyo. purchase this and we cover odawara, Disneyland and also gala yuzawa. 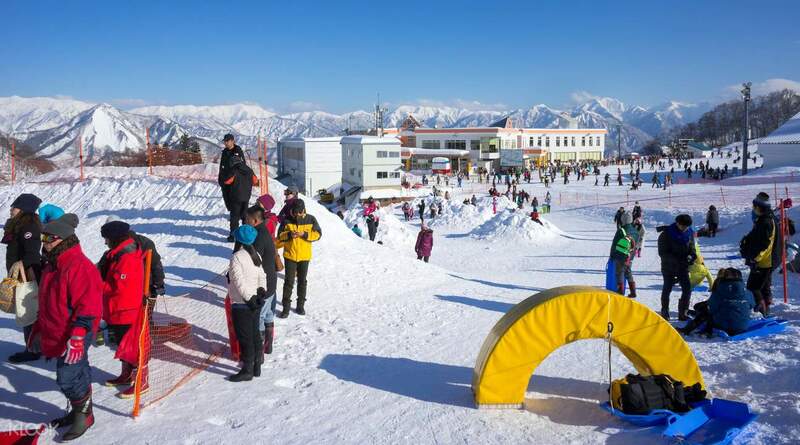 can also get discount for rental at gala yuzawa. pls bring your kids to gala yuzawa. really the best. Jr pass is the best option to travel around tokyo. purchase this and we cover odawara, Disneyland and also gala yuzawa. can also get discount for rental at gala yuzawa. pls bring your kids to gala yuzawa. really the best. JR East Pass is amazing coz as it will be 5 days of your choice. Planning well would help to maximise use of this pass. Got it exchanged at JR Ueno Station and it was quick. Managed to visit Nagano, Matsumoto, Niigata City, Nikko, Yuzawa, Karuizawa, Kawaguchiko (till Otsuki) and around Tokyo with local JR lines. JR East Pass is amazing coz as it will be 5 days of your choice. Planning well would help to maximise use of this pass. Got it exchanged at JR Ueno Station and it was quick. Managed to visit Nagano, Matsumoto, Niigata City, Nikko, Yuzawa, Karuizawa, Kawaguchiko (till Otsuki) and around Tokyo with local JR lines. I used Flexible 5 Day JR Nagano/Niigata to travel Japan Nagano Matsumoto Echigo Yuzawa and Kamakura.Day 1 I took Shinkansen from Tokyo to Nagano to visit Snow Monkey . Day 2 I took Express Train from Nagano to Matsumoto to visit Matsumoto Castle .Day 3 I took Express train to Nagano station transfer Shinkansen to Echigo Yuzawa for Snow skiing . Day 4 took Shinkansen to Tokyo station and Day 5 I took Express Train from Tokyo to Kamakura to visit Kamakura Buddha .JR Nagano / Niigata pass is really a good choice to choose when you want to visit Nagano and Niigata . I used Flexible 5 Day JR Nagano/Niigata to travel Japan Nagano Matsumoto Echigo Yuzawa and Kamakura.Day 1 I took Shinkansen from Tokyo to Nagano to visit Snow Monkey . Day 2 I took Express Train from Nagano to Matsumoto to visit Matsumoto Castle .Day 3 I took Express train to Nagano station transfer Shinkansen to Echigo Yuzawa for Snow skiing . Day 4 took Shinkansen to Tokyo station and Day 5 I took Express Train from Tokyo to Kamakura to visit Kamakura Buddha .JR Nagano / Niigata pass is really a good choice to choose when you want to visit Nagano and Niigata . easy to use! 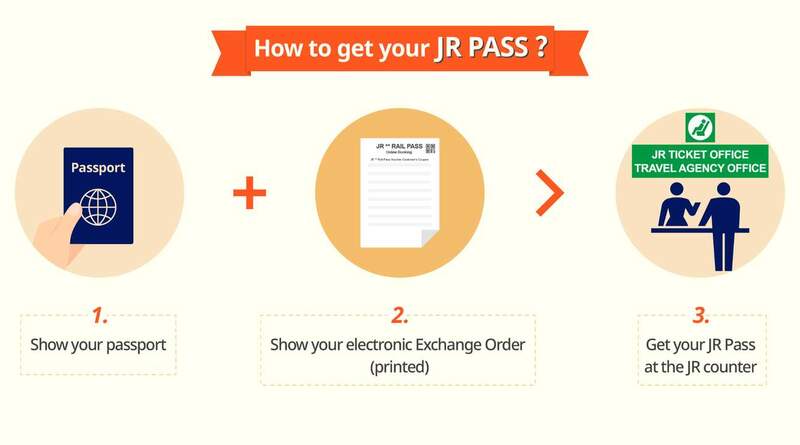 just redeem the jr pass at the service center at the airport. short queueing time, time saving and cost saving. reservations at the center also are very quick. easy to use! just redeem the jr pass at the service center at the airport. short queueing time, time saving and cost saving. reservations at the center also are very quick. Exceptional! Saved several thousands of Yen by availing of this pass. My computed total cost if we did not avail of the pass is ¥25,500-¥27,000. With this privilege, only spent ¥17,000 since it was bought outside of Japan. Buying it within the country would increase the cost to ¥18,000. It can even be used for JR buses. There is also no need to use it in consecutive days as the 5-days are only counted on the day that the service is availed. Meaning you can skip a day if you plan to stay in the hotel the whole day. Quick note though, it expires I think after 14 days. Exceptional! Saved several thousands of Yen by availing of this pass. My computed total cost if we did not avail of the pass is ¥25,500-¥27,000. With this privilege, only spent ¥17,000 since it was bought outside of Japan. Buying it within the country would increase the cost to ¥18,000. It can even be used for JR buses. There is also no need to use it in consecutive days as the 5-days are only counted on the day that the service is availed. Meaning you can skip a day if you plan to stay in the hotel the whole day. Quick note though, it expires I think after 14 days.